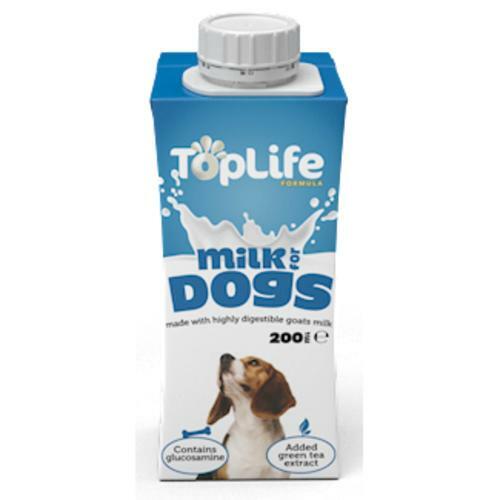 Toplife Goats Milk is a highly digestible goats' milk for Dogs with added Glucosamine, Chondroitin and Green Tea Extract. No artificial colours, flavours or preservatives, Can be used as a healthy treat or added to dry food. There is nothing artificial, just delicious goats' milk. But we've added some important glucosamine and chondriotin to help maintain healthy joints and Green Tea Extract to help support the immune system. The refreshing treat is a fantastic way to complement your dog's diet, giving you the peace of mind that it is also nutritionally beneficial. Dogs love milk but can sometimes have problems digesting cows' milk. Goats' milk is different. The fat globules found in goats' milk are typically smaller than those found in other animal milks, making them easier to 'break down' and digest in the gut. Dogs can't get enough of our delicious milk and it also helps keep them hydrated, especially in the warmer months. You can add a splash of TopLife Milk for Dogs to your pet's dry food or feed on its own as a daily treat they'll love! Our two resident dogs on our farm in Cheshire always help with our taste tests and they can't get enough of it! Recloseable Carton: Once opened, store in the fridge so your dog can enjoy the milk later!